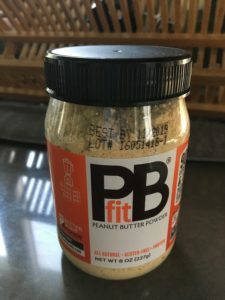 PB Fit is a non-gmo peanut butter-based powder that can be used in a multitude of ways. It’s good for people and for pets. The big selling point is the taste, it’s got a great PB taste and it’s only 1/3rd the calories and 87% less fat! They suggest using it in pancakes or a smoothie. I did something very easy and put it in some vanilla soy milk. I liked that a lot. I also put some in my pet’s food and mixed in some water with their nighttime feeding. They loved it as well. Of course, you can make peanut butter out of it if you’re so inclined. Just mix water. This is a product that has a ton of uses and it fits in with anybody who wants to eat healthy. They make them in larger sizes for big box stores as well.